Many individuals develop small, hard lumps on the surface of their tonsils. These pale-colored masses are commonly referred to as tonsil stones or tonsilloliths, and they can lead to irritation and other unpleasant side effects in some patients. Although the exact causes of tonsil stones are often difficult to determine, tonsil stones often occur when hardened matter builds up in small pockets on the tonsils’ surface. This build-up of debris is the result of harmful microorganisms, dead cells, mucus, and food particles accumulating around the back of the throat near the tonsils. The tonsils are two oval-shaped lymphatic organs located on either side of the back of your throat. Each tonsil has an irregular surface with uneven crevices called the tonsillar crypts. While the tonsils function in the trapping of harmful microorganisms to protect the throat, respiratory tract, and gastrointestinal tract, they can also become clogged with excessive amounts of other materials. Over time, these substances are broken down by salivary enzymes, leaving hard, calcified deposits behind. If this accumulation happens, the debris can become concentrated in white formations along the tonsillar crypts. Studies demonstrate a correlation between individuals with tonsil difficulties and chronic post-nasal drip. Additionally, tonsil stones tend to occur most often in people who experience chronic inflammation in their tonsils or recurrent episodes of tonsillitis. Causes of tonsil stones may be due to allergies which lead to tonsil-stone formation, as the persistent strain on your immune system can reduce your tonsils’ ability to remove foreign materials. For some people, causes of tonsil stones may be due to diet. For example, consuming large amounts of dairy products stimulates mucus formation, which can make tonsil stones more likely. 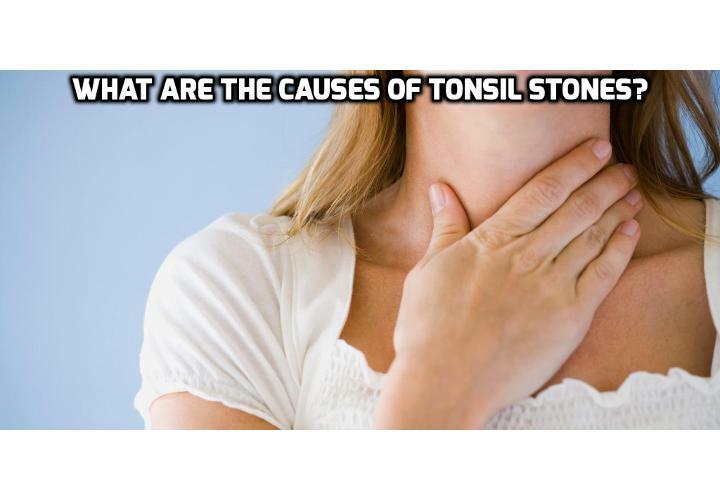 Also, other causes of tonsil stones may be due to alcohol and tobacco usage which dries out the mouth and throat, reducing salivary effectiveness and making your mouth prone to infection. Finally, poor oral hygiene is also associated with tonsil stones, as high levels of oral bacteria indicate a greater chance of oral-health problems. Tonsil stones rarely create noticeable symptoms, as they are usually small and easily overlooked in most patients. If these masses grow particularly large and become solidified, however, you may experience multiple symptoms, such as chronic bad breath, swollen tonsils, a perpetually sore throat, earaches, visible white debris at the back of your throat, and difficulty swallowing. If this is the case, see your doctor. Watch this Video – Tonsil Stones Causes – What Causes Tonsil Stones? How to Address Eczema Problem for Active Individuals? How to Treat Bad Body Odor? Previous PostPrevious In What Ways Can Tonsil Stones Be Contagious ? Next PostNext What Are Tonsils And Tonsil Stones?